In 1985, native Vermonter Leonard Knight found himself trying to get a hot air balloon off the ground in the desert just north of Niland, California. The balloon was hand sewn by Leonard and embroidered on the side was his personal creed… “God is Love”. After countless repairs on the patchwork balloon, he gave up. Leonard decided instead to build a small tribute to express his faith, starting modestly with a half bag of cement. Over 25 years later, Leonard’s work still isn’t done. He’s used adobe, hay bales and over 100,000 gallons of paint to craft a six story monument called Salvation Mountain. In demonstrating his personal faith; he’s created one of the most amazing folk art installations in the world. Adjacent to Leanard's Mountain you'll find Slab City. The name derives from the concrete foundation slabs left behind when the government tore down what was once a World War II Marine barracks called Camp Dunlap. It apparently was the training ground for Patton's armored assault on Northern Africa. Before long, squatters began camping there and the city was born. 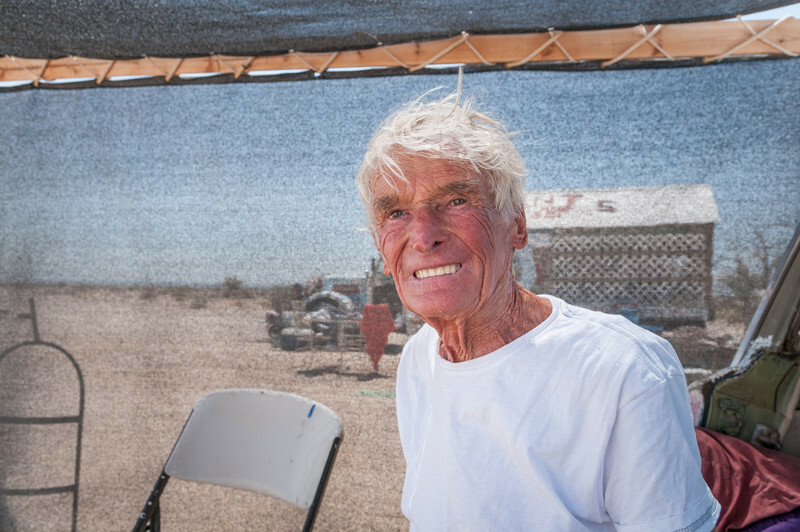 Today there are about 150 year-round residents and scores of snowbirds that enjoy no electricity, no running water and the desert heat of the "last free place" that is Slab City.